Zion Market Research has published a new report titled “Biosurfactants Market (Glycolipid, Lipopeptides and lipoproteins, Surfactin and lichenysin, and Polymeric biosurfactants) for Detergency, Emulsification, Personal Care Products, Environmental Remediation, Lubrification, Mineral Flotation, Petroleum Recovery, Pharmaceuticals & Cosmetics and Other Applications: Global Industry Perspective, Comprehensive Analysis and Forecast, 2016 - 2022”. 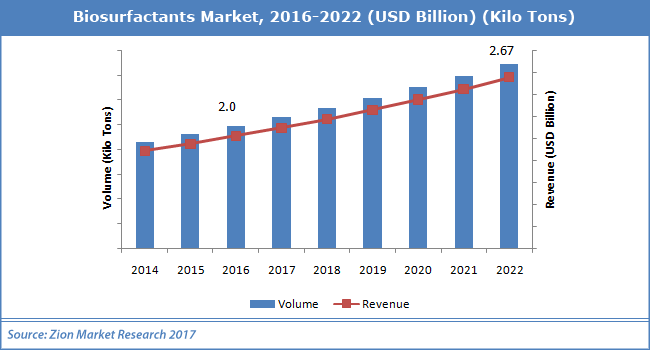 According to the report, the global biosurfactants market accounted for USD 2.0 billion in 2016 and is expected to reach USD 2.67 billion by 2022, growing at a CAGR of 4.2% between 2017 and 2022. Biosurfactants are also known as microbial surfactants. Biosurfactants are amphiphilic compounds. These are defined as surface active biomolecules produced by microorganism with unique environment-friendly properties. Biosurfactants are surface-active agents that act as detergents, wetting agents, foaming agents or emulsifiers. Biosurfactants can potentially replace virtually any synthetic surfactant and, moreover, introduce some unique physicochemical properties. The unique properties like low toxicity, specificity, high biodegradability, antibacterial, antifungal and antiviral properties, and much more attractive the consumers towards biosurfactants. The biosurfactant market has a remarkable growth potential particularly because of the increasing environmental concerns, the advancement in biotechnology and emergence of more stringent laws have led to biosurfactants being a potential alternative to the chemical surfactants available in the market. Factors such as high manufacturing, processing and purifying cost can restrain the growth of global biosurfactants market during the forecast period. Biosurfactants enhance the surface area of hydrophobic water-insoluble substrates that organism utilizes it for its growth and work efficiently in process of biodegradation, bioremediation, and biocontrol. The global biosurfactants market is segmented on the basis of types by application and by geography. Based on the type of biosurfactants, the global market is categorized into four major types such as glycolipid (rhamnolipids, trehalolipids, and sophorolipids), lipopeptides and lipoproteins, surfactin and lichenysin, polymeric biosurfactants. glycolipid (sophorolipids) is one of the fastest growing segments by product type in global biosurfactants market due to its potential commercial exploitation. Sophorolipids is preferably used in agriculture, biomedicine, bioremediation, food, cosmetics, and bio pesticides applications may propel the global biosurfactant market during the forecast period. Based on the application the global biosurfactants market is segmented into detergency, emulsification, personal care products, environmental remediation, lubrification, mineral flotation, petroleum recovery, pharmaceuticals & cosmetics and others. The Strong scope of application in personal care items and detergents can favor industry growth. Personal products segment is growing in developing countries due to rising awareness and consciousness about advantages of naturally derived products. Detergency segment in the application also holds a significant share in 2016 and 2022 for global biosurfactants market. Moreover, the rising use of biosurfactants in leather processing, in pollution control, and in pharmaceutical & cosmetics industry will propel the market during 2017 to 2022. In terms of geography, North America and Europe dominated the market for biosurfactants in 2016 owing to the favorable government regulations in the region that have promoted the adoption of biosurfactants. Europe held the major share of the global biosurfactants market due to recovering economies and increasing income and expenditure on consumer goods and expanding promotion of bio-based products. Asia Pacific is expected to witness significant growth owing to the large demand for water pollution control and increasing awareness among consumers for bio-based products in the region. Some of the key players operating in the global biosurfactants market are BASF Cognis, Ecover, Jeneil Biotech, Saraya, Synthezyme LLC, Urumqui Unite Bio-Technology Co. Ltd., AGAE Technologies, MG Intobio, Henkel Ag & Co. Kgaa, Kemin Industries, Inc, among others. Zion Market Research is an obligated company. We create futuristic, cutting edge, informative reports ranging from industry reports, the company reports to country reports. We provide our clients not only with market statistics unveiled by avowed private publishers and public organizations but also with vogue and newest industry reports along with pre-eminent and niche company profiles. Our database of market research reports comprises a wide variety of reports from cardinal industries. Our database is been updated constantly in order to fulfill our clients with prompt and direct online access to our database. Keeping in mind the client’s needs, we have included expert insights on global industries, products, and market trends in this database. Last but not the least, we make it our duty to ensure the success of clients connected to us—after all—if you do well, a little of the light shines on us. New York, 10001, United States.